Oh its that special time we all get SPOOKY! 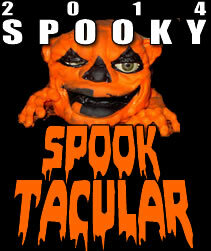 Join The Creepy Kentuckian and Uncle Bill this week for our THIRD annual Spooky Halloween Spooktacular as we give a full Spookilicious rundown of everything we've been doing this Halloween Season, talk about some of the latest horror news, Scream Factory's Shocktober...Musical interludes and a whole HELLUVA lot more! Also country superstar JOE DIFFIE is debuting his new song 'I Saw Enough' on this special HALLOWEEN episode, The yearly Scary Stories To Tell In The Dark reading and our plans for HALLOWEEN NIGHT all of this on a very SPOOKY edition of everyone's favorite Horror Show...DEADPIT Radio! This time we watch movies to race to Halloween with The Houses that October Built, Dracula 1931, and discuss the puzzling F@#@in Halloween 2 F@#@! 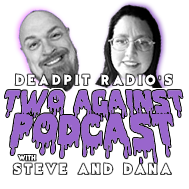 Rocktober is in full effect this week on DEADPIT Radio as we go through some of the latest happenings in the world of horror. Join CK and The B-Plan as they go through the latest horror movie news, just what is up with the Scream Factory/Night Breed debacle and all of the horror goodness the two hosts have been watching this season thus far. So sit back, shut your mouth and open your ears for the best horror talk radio show going on damn near 10 years...its DEADPIT Radio!! This week replacing the regular scheduled DEADPIT show we present DEADPIT LIVE on YouTube tomorrow night at 10pm...we may have some surprise guests join us to talk all things horror this HALLOWEEN season. Check back here around 10pm EST for a live link, or on the DEADPIT YouTube page! Much has been made recently about the package design and pricing of the "Black Maria" edition of the TCM. Both the gimmick and the idea for this set is truly confounding to me, especially since a deluxe edition of this movie would seem like a no-brainer in terms of collectible holy grails. Instead, horror fans are treated to a generic, over-priced heap that only serves to tarnish the legacy of a true classic of the genre. Thankfully, there are many editions of the new 40th Ann. TCM Blu-ray, including the one disc version I'll be reviewing here, as well as a four-disc edition that won't be covered. The Texas Chainsaw Massacre is rightfully lauded as one of the most disturbing, creative and realistic horror experiences ever captured on film. In this case, the old saying "captured on film" is truly accurate because I can't imagine that a film can ever again capture the true discomfort, grittiness, or dread portrayed here. From the opening voiceover into the shutter flashes and camera sound effects, the beginning of the movie foretells the doom the audience is about to bear witness. Sally Hardesty, her wheelchair-bound brother Franklin, and friends Pam, Kirk and Jerry are on a road trip to visit an old house once owned by Sally's grandfather. Along the way, they encounter a spastic and clearly disturbed hitchhiker (Ed Neal in one of the most believable and unsettling performances ever) who tells them about his family of meat butchers living in the area. Before long, the crew accidentally runs afoul of their house of horrors, inhabited by the now infamous and loveable Leatherface (Gunnar Hansen's portrayal has never come close to being matched). Before it's over, the stage- and table- is set for a dinner party that is as squirm-inducing now as it was in 1974. There are so many good things within this film that it's hard to isolate even just a few, but I'll try. First off, Ed Neal and Jim Siedow (the Cook) don't seem at all to be acting. Each actor has such unique gestures, twitches, and pathology that it's impossible to see them as performing here. I've watched this film at least 20 times, and I can never catch either acting. Some of the other performances are slightly stilted (most notably Jerry and Kirk), but the performances of the family are seamless. The insanely labile facial expressions of The Cook as he gleefully pokes a screaming and helpless Sally are worth studying for days. 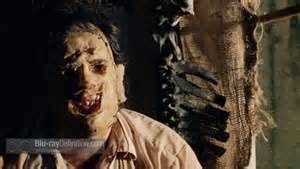 Second, unlike every other sequel, remake, prequel or copy of this film, Leatherface is not portrayed here as a hulking psychopath out to stalk and slash innocent victims. Instead, he is portrayed rather child-like and reserved. The motive for his killing in this film seems to be to protect his home from unwitting kids stumbling into it. During the dinner scene, Leatherface is seen donning a makeup-smeared mask almost like a child dressing up as his mother to serve an imaginary dinner. Speaking of which, the culmination of the film-almost like a crescendo of nervous energy- is truly a thing to behold. Marilyn Burns as Sally fills the room with more mania and terror than a lunatic asylum. In fact, the ending is so hard to endure that it's almost torturous to sit through the chainsaw-waltzing end. In preparation for the new MPI Blu-ray release, I watched every version of the film that I had available: the bare bones Pioneer DVD, the previous Dark Sky Blu-ray, and the 40th anniversary singe-disc. The Pioneer DVD is almost too dark to make out certain pivotal scenes, especially the night scenes involving Leatherface, Sally, and Franklin. The first Dark Sky Blu-ray (which I think is now OOP) is a huge improvement in terms of color correction and detail. The 40th anniversary edition, however, looks like it was filmed as recently as a few years. The colors are vivid and sharp, and there are details that I never noticed in any other edition of the film- especially details involving extras in the opening scenes and eccentricities about the family's house. Our Live Drunken Commentary from last weekend is up and available to download in the fan commentary section... It's also up for free on the Deadpit Roku Channel!! 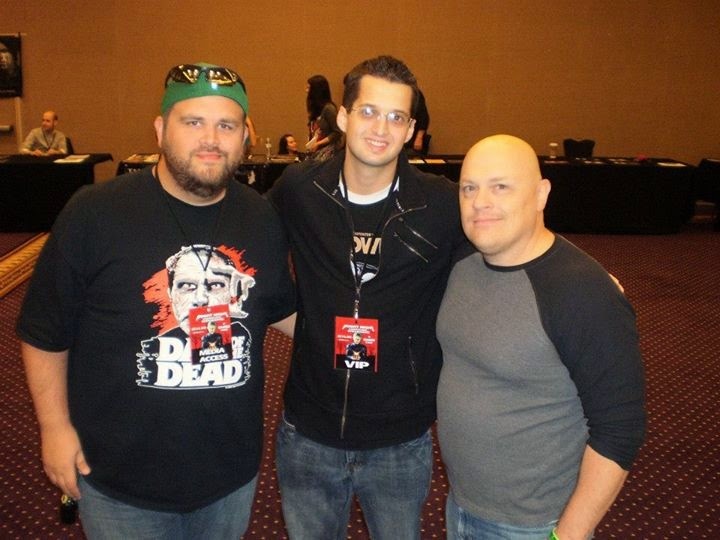 As Rocktober gets into full force the originators in Horror Talk Radio return from a fun weekend in Louisville to their home in Appalachia and are ready to dive head first into some Halloween Horror Goodness. The Creepy Kentuckian and Uncle Bill join you this week going through all the happenings from this past weekend's Fright Night Film Fest, how Uncle Bill almost died, the majesty of the new DEADPIT Roku Channel PLUS we go through our Halloween Horror Movie Picks for 2014, all of that and more on a very special edition of everyone's favorite horror show, DEADPIT Radio! This time we check out the swinging doc The Lifestyle, the stranger within. and phantom of paradise. We take a trip to the midnight movie The Room with tons of Spoons flying around someone is going to get hurt. Fright Night Horror Weekend 2014, Site updates and more! 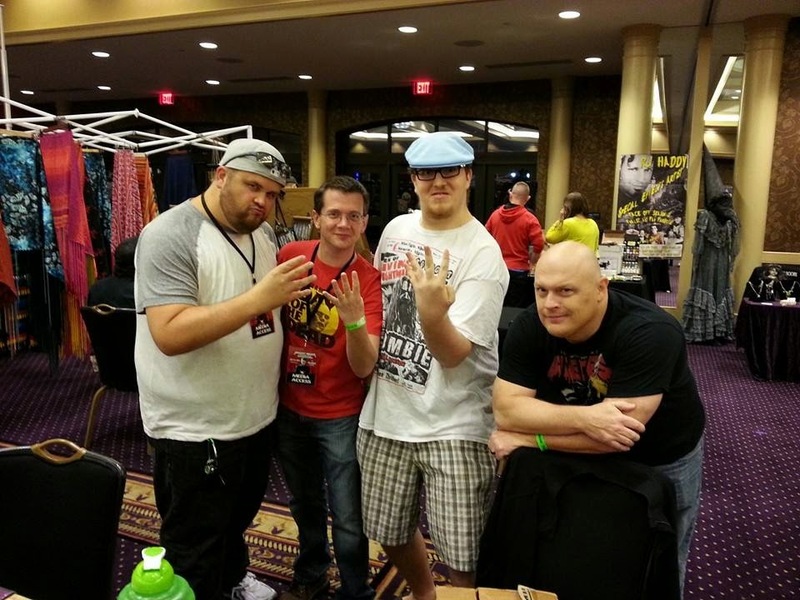 Hope everyone has had a great weekend, we are now home after an eventful one in Louisville's Galt House Rivue Tower for the 2014 Fright Night Halloween Horror Show! It was so awesome seeing some familiar faces in addition to new ones! 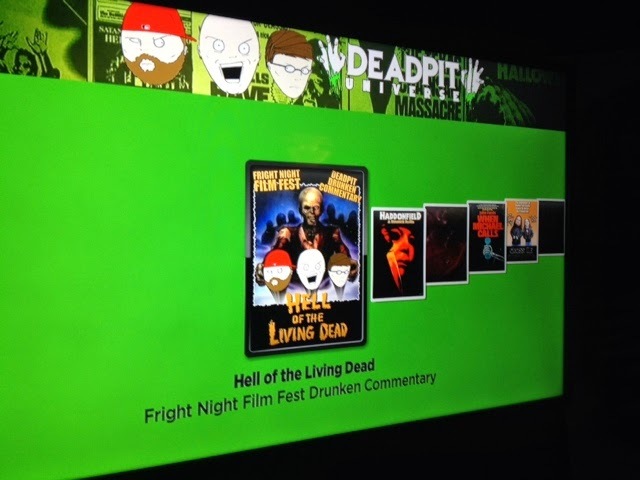 I have found a couple of pictures of the DEADPIT guys at the show and thought I would post them on here and thank everyone again for coming out to the Hell of the Living Dead Drunken Commentary on Friday Night. That particular commentary should be up featured on the Fan Commentary section by the end of the week, and should also be featured on the DEADPIT Universe Roku channel very soon. We also wanted to update you all with some website news, I've received some messages regarding a couple of past shows that won't download or have dead links. I have fixed the January 2008 and February 2008 shows that had dead links. As well as our show from last year with Buddy Cooper of 'The Mutilator'. Also a special thanks from CK to all of those who have contributed their Ultraviolet and VuDu codes to his digital library, CK recently passed the 1500 plus movie mark and wanted to thank you all for your contributions! CK and the B-Plan open up the Halloween season by chiming in just hours before the 2014 Fright Night Film Fest begins in Louisville KY. The duo goes through the guest lineup this year, the sights, sounds and eats of Downtown Louisville and much more. Also we go through the weeks horror news, upcoming Blu-Ray releases this month, What Eli Roth will do when CK texts him and more this week on an pre-convention episode of DEADPIT Radio!